This composite image of M31 (also known as the Andromeda galaxy) shows X-ray data from NASA's Chandra X-ray Observatory in gold, optical data from the Digitized Sky Survey in light blue and infrared data from the Spitzer Space Telescope in red. The trigger that ignites a common type of stellar explosionhas finally been uncovered with observations from NASA's Chandra X-rayObservatory, providing a major advance in the understanding of supernovas. These supernovas, called Type 1a, result from the explosionof a white dwarf star. These types ofsupernovas are used as cosmicmile markers, and knowing what causes these stellar blow-ups is a criticalkey to studying the mysterious dark energy that astronomers think pervades theuniverse. "These are such critical objects in understanding the universe.It was a major embarrassment that we did not know how they worked," said MaratGilfanov of the Max Plank Institute for Astrophysics in Germany and a member ofthe team that made the new findings. "Now we are beginning to understandwhat lights the fuse of these explosions." Type Ia supernovasare generally thought to go off when a white dwarf star ? the remnant core of ared giant star that has sloughed off its outer gas layers and cooled down ?exceeds its weight limit, becomes unstable and explodes. But just what causes it to tip the scale and get blown tosmithereens hadn't been pinned down. Two possibilities for pushing a whitedwarf over the edge were considered the main contenders: accretion, in which awhite dwarf siphons off material from a sun-like companion star until itexceeds its weight limit; and the merging of two white dwarfs into a biggermass. One way for telling which process was the culprit waslooking at the X-ray light emission from supernovas, as each scenario wouldgenerate different amounts of X-rays. A Type Ia supernova caused by accretingmaterial produces significant X-ray emission prior to the explosion, while asupernova from a merger of two white dwarfs would create significantly less. 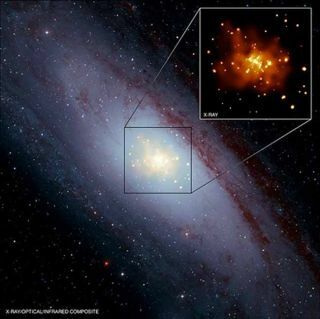 To see which scenario was likely the cause of Type 1asupernovas, Gilfanov and his team used the ChandraObservatory to observe five nearby elliptical galaxies and the centralregion of the Andromeda Galaxy (or M31). The scientists found that the observed X-ray emission was afactor of 30 to 50 times smaller than expected from the accretion scenario,effectively ruling out this mechanism and making white dwarf mergers the mainsuspect in these galaxies. "Our results suggest that the supernovas in thegalaxies we studied almost all come from two white dwarfs merging," saidteam member Akos Bogdan, also of Max Planck. "This is probably not whatmany astronomers would expect." The unexpectedness stems partly from the fact that fewdouble white dwarf systems seemed to exist and that such pairs are difficult tosee even with the best telescopes. "Now this path to supernovas will have to beinvestigated in more detail," Gilfanov said. The difference between these two scenarios may haveimplications for how these supernovas can be used as "standardcandles" to track vast cosmic distances. Type 1a supernovas have generallybeen thought to be excellent distance guides because they can be seen to largedistances and follow a reliable brightness pattern. But because white dwarfs can come in a range of masses, itmeans that the merger of two of them could result in explosions that varysomewhat in brightness. One question that remains to be answered is whether thistrigger that seems to be the cause of Type 1a supernovas in elliptical galaxiesis also the fuse for these stellar explosions in spiral galaxies.